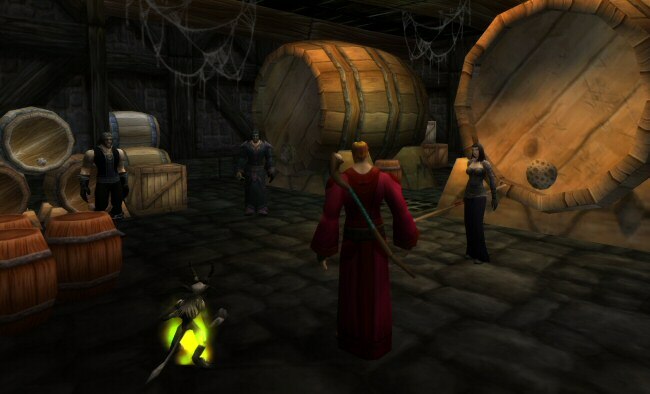 Inside, a woman named "Morrrigan" is giving a pep talk to some other adventuring types. "You've got to listen!" she shouts. "Always!" The other adventurers seem to react randomly. One salutes. Another laughs. Another breaks into dance. Morrrigan continues, "Always unless they are utterly wrong follow the orders of your leaders. ALWAYS." One of her charges stops dancing to ask, "What leaders?" "I have none," another says. "Don't worry," she assures them. "You'll find some." "Hey," Norman whispers as he nudges me with his foot. "Let's go. My instructor isn't up here." "You sure you don't want to stay for the rest of this? You could learn a thing or two from this lady." We eventually find the Warlocks in the musty, dimly-lit basement of the inn. Norman talks to his teachers for a minute and then storms upstairs. "So what new trick did you learn?" I ask. "Nothing," he answers dejectedly. "I can't afford the training." "So? Kill one, and torture the other until she tells you what you want to know." "That would be wrong," Norman says with a shake of his head. "It's the law of evil: That which does not kill you is a complete wuss that totally had it coming." "Uh. Thank you. Very profound." "Now get in there and burn her down." "No. I know where to get some money." This can actually happen to new players. You may find yourself too broke to afford new abilities in the first few levels. It's not a huge deal (this part of the game is still pretty gentle) but it means your first character will be the hardest. Later on you might start another character, but be able to use money and gear from your established one. Just a single gold piece - peanuts to even a mid-level character - is enough to vastly improve your gear and pay for every single upgrade for the first dozen or so levels. In old MMO games this dynamic would lead to "beggars." A newbie realizes that one minute of effort on the part of a high level character (which is how long it would take them to earn a gold) could save them an hour or more of time by easing the leveling, reducing the number of trips back to town, and saving them from a few corpse runs. 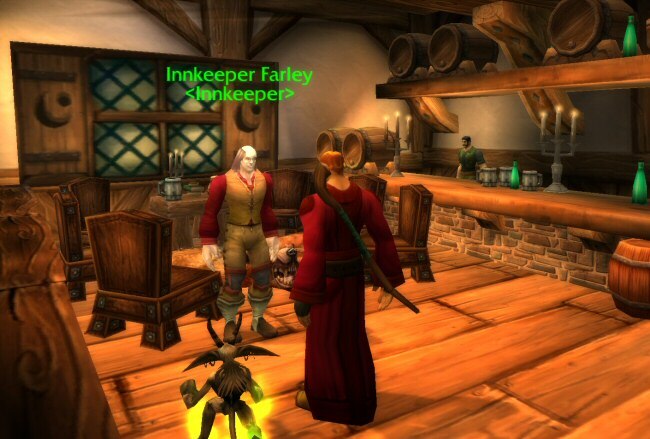 In WoW this isn't a very big deal as there are other ways to get your character rolling. Keep an eye out in trade chat or guild recruitment chat. Often someone will be starting a new guild and will need signatures on the guild charter. These people don't actually want you in the guild - they just want your signature. You can sign and then quit the guild as soon as it's formed. High level characters will usually pay between one and ten gold for this service, which ought to be enough to launch your career as a budding adventurer. "Okay, here is a broken fang from some kind of animal, an old boot, a couple of shreds of cloth, and I think this is a bit of skin from a diseased wolf," Norman says to the innkeeper. We're standing in the busy dining area of the inn. There's a roaring fire going here and a few adventurers have gathered around it to warm themselves despite it being the middle of the afternoon. And summer. Other adventurers are sitting or walking about, having energetic and disjointed conversations. "A pleasure doing business with you!" the innkeeper says as he hands over a few silver coins and accepts the armload of random crap. "What in the name of completely awesome are you doing?" I ask once the transaction is complete. "Ah," Norman says. "The trading? Yeah. Something I figured out a few months ago. Apparently all the shopkeepers in Azeroth are barking nutters. They'll buy almost anything you've got on you. It's how I paid for tuition for mage school." "You went to mage school?" "Eh. For a couple of months, until I flunked out. Mother thinks I'm still there." "You flunking out of mage school certainly explains a lot," I observe. "Oh hush. So I have to save the kingdom with demon power instead of arcane. Big deal. It's all the same to me as long as the place gets saved." "That's a very open-minded viewpoint," I tell him. "I'm starting to really hate your guts a lot less." "Well, it's only a good plan as long as mother doesn't find out."